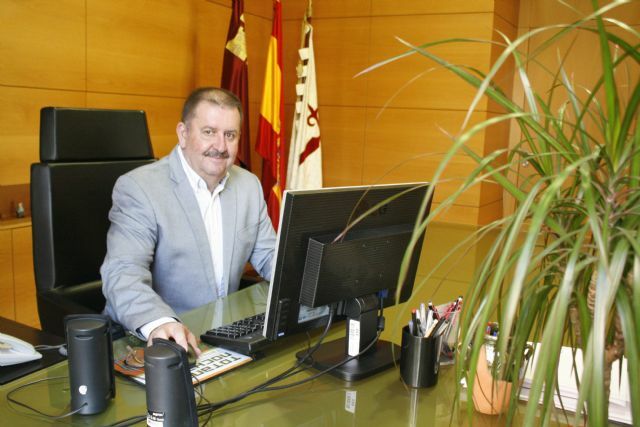 only behind Abarán (13,089 inhabitants), which registers a percentage of unemployed of 9.35%, according to the mayor, Andrés García. and stressed that this is the lowest in the last seven years. The municipalities of Cehegín (21.94%), La Unión (21.06%), Fortuna (19%), Calasparra (18.95%) and Bullas (18.55) are the ones with the highest unemployment rate in this ranking. %). 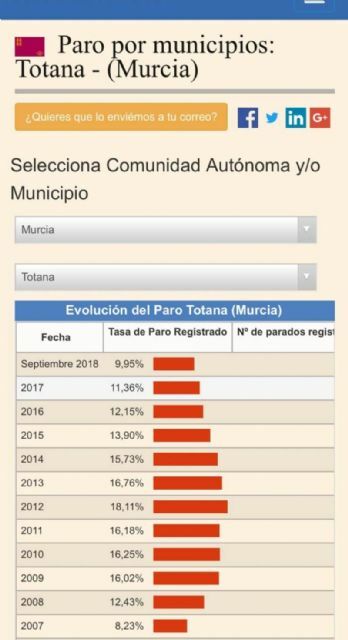 In addition, the evolution of unemployment in Totana in recent years has been reduced considerably, as explained by the mayor, who says that this figure has been falling from 18.11% (2,414 unemployed) in 2012 to September of this year that fixed at 9.95%. In recent years, the rate of unemployment in Totana has been falling to today: 16.76% (2013), 15.73% (2014), 13.90% (2015) and 12.15% ( 2016). In the ranking of municipalities in the region with more than 40,000 inhabitants, currently, the most affected in this field are Sewer (19.66% -3,757 unemployed-), Cartagena (17,02% -16,311 unemployed-), Molina de Segura (15.61% -5.121-), Murcia (15.27% -30.932-) and Lorca (11.75% -4.949-). The mayor recalled that the unemployment rate refers to the percentage of unemployed over the active population and attributed these good figures in Totana to the commitment of the business fabric of the municipality and the good policies of training, integration and labor inclusion that are being carried out. in the Local Development Center as in the Business Incubator. Andrés García stressed that "the levels of job creation and reduction of unemployment are very intense and confirm that the objectives we set at the beginning of the term were ambitious but realistic, but to maintain and accelerate that inertia is fundamental. include new actions and do so from the point of view of cohesion with the main economic and social agents ".